Cleaning and maintaining your home’s carpet can be tricky no matter the color or texture. Many families and individuals tend to experience the same mishaps – liquid spills, muddy paw prints, and everyday wear. Taking preventive measures to keep it clean can save you money from having to buy expensive cleaning products. Have your carpet professional steam or deep cleaned as often as needed. Be sure to compare quotes from different professional cleaning companies before making a final decision. For mold and mildew, use a non-chlorine bleach or lemon juice and salt solution for colored fabrics. Take care of spills as soon as possible. Using water on a spill will work fine. A mixture of water and vinegar helps to keep stains out. Vacuum often enough and be sure to do it correctly – going over the floor in several directions in order to pick up all the debris it can. Place entrance mats in your home. This will keep most of the tracked in soils off the carpet surfaces. Conduct a routine cleaning weekly or bi-weekly. Be sure to draft a cleaning schedule to help you. 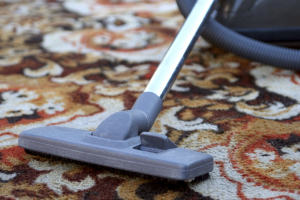 Keeping your home’s carpet clean can prolong the life of the carpet. A healthy looking carpet adds value to your home if it is well maintained. © 2014 Green Elite Clean. All Rights Reserved. Powered By: Reputation Impression.